Kinnard Farms won a U.S. 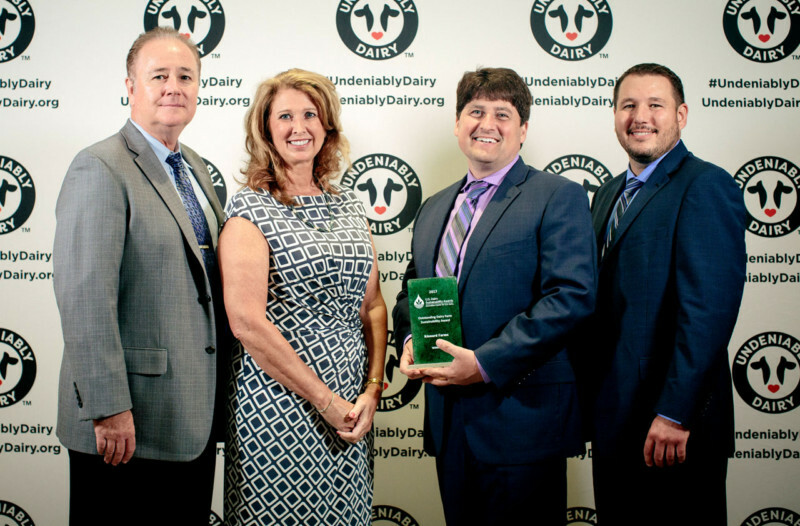 Dairy Sustainability Award at an awards ceremony in Chicago on June 28 for their innovative ways to maximize water, soil and cow comfort while supporting their rural community. Left to right are family members David and Jackie Stewart, Lee Kinnard, and Matt Nuckols, event M.C. and Virginia dairy producer. ROSEMONT, Ill. —The Innovation Center for U.S. Dairy®, established under the leadership of dairy farmers, announced its sixth annual U.S. Dairy Sustainability Awards in a June 28 Chicago ceremony. The program recognizes dairy farms, businesses and partnerships whose practices improve the well-being of people, animals and the planet. Kinnard Farms, Casco, won a national award for Outstanding Dairy Farm Sustainability. The farm was one of three national winners in their category. Judges evaluated nominations based on their economic, environmental and community impact. The independent judging panel — including experts working with and throughout the dairy community — also considered learning, innovation, scalability and replicability. From farm to table, transparency and ingenuity drive dairy forward, as demonstrated in the newly released 2016 Sustainability Report, which describes the Innovation Center’s first-ever strategic plan focused on social responsibility. This was developed by dairy community leaders in anticipation of the consumer landscape’s increasing pressures around health, environmental impacts and ethical practices—something dairy farmers factor into the decisions they make on their farm every day. The U.S. Dairy Sustainability Awards program is supported by generous sponsors. This year’s sponsors are: DeLaval, Elanco, Syngenta and World Wildlife Fund. The 2016 U.S. Dairy Sustainability Report is the sixth progress report published by the Innovation Center for U.S. Dairy to update stakeholders on the progress of the U.S. Dairy Sustainability Commitment, an industry wide effort to measure and improve the economic, environmental and social sustainability of the dairy community. To learn more, visit USDairy.com/Sustainability.